It's perhaps unfair to write a single review Fantagraphics' collection Los Tejanos & Lost Cause by the late Jack "Jaxon" Jackson, underground comix initiator and comic historian of Texas. The two works, though superficially similar, are subtly different in terms of storytelling and overall quality. It's perhaps unfair to write a single review for the two, but it's getting late, I'm tired, and I teach in the morning. Jackson will probably always been most well-known for co-founding Rip Of Press in 1969 and for perhaps authoring the first underground comic, 1964's God Nose. But he deserves credit for his contribution to non-fiction and quasi-academic comics. 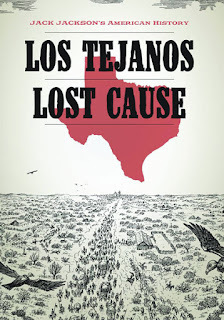 Los Tejanos (1981) and Lost Cause (1998) stem from Jackson's lifelong study of Texas history, research that he published both as graphic novels and as scholarly books. This is not to say that his comic histories are not scholarly. Indeed, Los Tejanos and Lost Cause are the products of serious historical research, and as such they are clear exhibitions of comics' potential as a viable media for academic and journalistic work. Now, to the review. Of the two works, I enjoyed Los Tejanos more than its companion. Though I found the historical content of Lost Cause fascinating, Jackson's treatment of Juan Seguin -- Tejano and militant for Texas's independence from Mexico -- is far more focused and coherent. Lost Cause tends to meander, lingering on the events of a Taylor clan get-together for a dozen pages, then jumping from event to event haphazardly, leaving the reader a bit confused as to how occurrences relate to one another and to the story's broader historical narrative. Los Tejanos is a much clearer and measured work -- and therefore much more enjoyable of a read. If there is a drawback to Los Tejanos, it is Jackson's unwillingness to explore the psychology of Juan Seguin, a man of militant conviction forced by circumstances to switch allegiance from his beloved Texas to his former enemy, Mexico. Jackson's failure to engage fully with Seguin's contradictory motivations and personal struggles may be simply a product of the author's seriousness as a historian: Seguin, after all, left no journal or other documentation that could provide insight into his private turmoil and troubles. But, as an artist and a scholar Jackson was well within his rights to speculate and informed enough to do so. Drama would have lightened the story somewhat, offsetting the often overwhelming historical detail Jackson presents. Now, I am obliged to address the following. I don’t want to be accusatory, but some of Johnson’s characterizations of African-Americans made me uncomfortable. Jackson attempts to disarm his critics by appealing to historical accuracy. His job as a historian is to provide insight into the social world of those he studies, to familiarize these figures so that we can empathize with and ultimately understand why they acted the way they did. There is something to this. This is why uproar surrounding Django Unchained’s use of…let’s call it “colorful” terminology fell flat. Most of us understand that historical fiction entails a certain degree of suspended offense. Texas in the 1860’s was not a tolerant place -- though, as Jackson shows is Los Tejanos, it didn't have to be this way. The heroes of Lost Cause are people whose morality is alien to ours -- and not only in terms of their views of other races. But a measure of sensitivity is nevertheless required of an artist and a historian when depicting stigmatized racial groups in an evenhanded manner. There are many panels and a few gags in Lost Cause that I found questionable. I imagine many of you would as well. I’m not going to get any further into this. I appreciate that Johnson sticks with the perspective of the “losers” -- Juan Seguin's struggles against racism following Texas’ rebellion and Texan Confederates' struggle to regain a sense of honor following the defeat of their cause. Los Tejanos and Lost Cause demonstrate -- as did much of Jack Jackson's work -- that scholarly concerns and serious research are not beyond the reach of comic books. And for that alone, I am obliged to recommend this collection.